These tests are used to determine the performance of the transmitter and typically require the use of only one signal. The interferer signal is applied to the transmitter port.The tests are used do to determine a range of attributes such as power adjustment capability in the presence of an interferer, and the ability to inhibit undesired signals due to intermodulation. The tests are supported on only the N5172B EXG or the N5182B MXG signal generators. The test case 6.2.6 Home BS output power for adjacent UTRA channel protection is different in that it uses a W-CDMA signal rather than an LTE signal as the interferer. Because it uses a W-CDMA signal, it requires having licenses for the N7600B Signal Studio for W-CDMA / HSPA+ as shown in the requirements. The test case 6.2.8 Home BS output power for co-channel E-UTRA channel protection has the option to use one or two interferers. When using two interferers, there is the potential to set a wide offset between the two signals that it exceeds the instrument's capability. Because of this potential, it is recommended that a separate signal generator be used for each interferer. Most of these tests provide the flexibility to combine waveforms into a single waveform file so minimal instruments are required. For example, use only a single signal generator as a standalone instrument, or use only one of the BBGs in the PXB with the PXB connected to one signal generator. The exception to this flexibility is the 7.6 Blocking (Co-Located) test. This test always requires the use of a separate signal generator or PXB BBG with an additional signal generator for each signal. The other 7.6 blocking tests may also require separate signal generators for each signal if the combined signals exceed the instruments bandwidth limitations. If this condition arises with the other 7.6 tests, the software provides a message. In addition with using the PXB, MIMO and fading are also considerations that can be added to the signals. A separate signal generator is required for each test signal, because the test signals cannot be combined into a single waveform file. But how these signal generators are controlled for the signals is dependent upon the Fading Simulator selection, PXB or External Fader. With the PXB, the PXB controls the signal generators based on input from the software. The PXB generates the signals, then using the PXB configuration set in the PXB Setting window, outputs the signals to the signal generators for upconverting. Because the PXB controls the signal generators, the Signal Generator fields in the test setting window are grayed out. With the external fader, the user must select a different signal generator for each signal. Each signal generator must be configured and show as connected in the Hardware Connections and Settings node. The software then controls, and downloads the signal and settings to each of the signal generators. For the test case 8.2.3 HARQ-ACK Multiplexed on PUSCH with the wanted signal FRC selection of A3-1, this signal can take minutes to generate. This is due to the longer waveform length required to provide enough randomness in the payload data. The computer's CPU speed also influences this time. In order to mitigate the generation time on subsequent Executes, the software, for the initial generation, creates a local waveform file that has a unique name .Upon a subsequent Execute, provided that there were no setting changes that includes the Common Settings, the software downloads the existing waveform file. This saves time because the software does not have to regenerate the file for download. For the software to use this feature, the target instrument must have the required Basic/Advanced waveform playback licenses for the Signal Studio software and the Override Settings unchecked (disabled). Test Case Manager's feature of using the Signal Studio real-time license in place of the playback licenses cannot be used. Upon a subsequent Execute, if any of the settings were changed since the initial waveform generation, the software creates a new waveform file with another unique name. The unique waveform file name is comprised of settings that includes whether it is FDD or TDD. The following table shows an example of a unique name and parses that name to show how it is created. To see whether a particular unique waveform file exists, use the Open Waveform Folder… function. 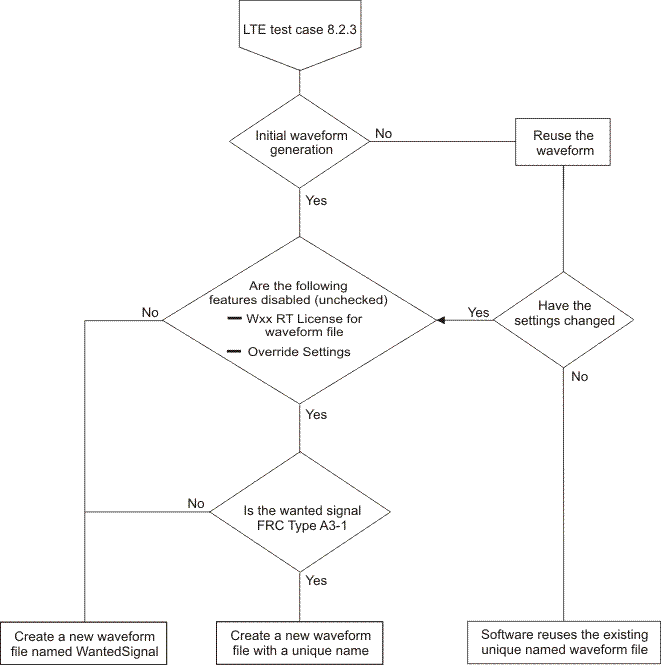 The following flowchart illustrates this unique named file creation process and reuse.